Southern blotting was named after Edward M. Southern who developed this procedure at Edinburgh University in the 1970s. To oversimplify, DNA molecules are transferred from an agarose gel onto a membrane. Southern blotting is designed to locate a particular sequence of DNA within a complex mixture. For example, Southern Blotting could be used to locate a particular gene within an entire genome. The amount of DNA needed for this technique is dependent on the size and specific activity of the probe. Short probes tend to be more specific. Under optimal conditions, you can expect to detect 0.1 pg of the DNA for which you are probing. 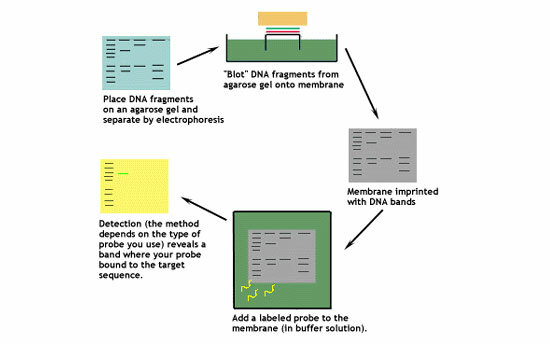 This diagram shows the basic steps involved in a Southern blot. Let's look at this technique in greater detail. 1. Digest the DNA with an appropriate restriction enzyme. 2. Run the digest on an agarose gel. 3. Denature the DNA (usually while it is still on the gel). For example, soak it in about 0.5M NaOH, which would separate double-stranded DNA into single-stranded DNA. Only ssDNA can transfer. A depurination step is optional. Fragments greater than 15 kb are hard to transfer to the blotting membrane. Depurination with HCl (about 0.2M HCl for 15 minutes) takes the purines out, cutting the DNA into smaller fragments. Be aware, however, that the procedure may also be hampered by fragments that are too small. Be sure to neutralize the acid after this step, or the base after the prior step if you don't depurinate. 4. Transfer the denatured DNA to the membrane. Traditionally, a nitrocellulose membrane is used, although nylon or a positively charged nylon membrane may be used. Nitrocellulose typically has a binding capacity of about 100µg/cm, while nylon has a binding capacity of about 500 µg/cm. Many scientists feel nylon is better since it binds more and is less fragile. Transfer is usually done by capillary action, which takes several hours. Capillary action transfer draws the buffer up by capillary action through the gel an into the membrane, which will bind ssDNA. 5. Probe the membrane with labeled ssDNA. This is also known as hybridization. Whatever you call it, this process relies on the ssDNA hybridizing (annealing) to the DNA on the membrane due to the binding of complementary strands. Probing is often done with 32P labeled ATP, biotin/streptavidin or a bioluminescent probe. A prehybridization step is required before hybridization to block non-specific sites, since you don't want your single-stranded probe binding just anywhere on the membrane. To hybridize, use the same buffer as for prehybridization, but add your specific probe. 6. Visualize your radioactively labeled target sequence. If you used a radiolabeled 32P probe, then you would visualize by autoradiograph. Biotin/streptavidin detection is done by colorimetric methods, and bioluminescent visualization uses luminesence. Treat the dsDNA fragment that you are using as a probe with a limiting amount of Dnase, which causes double-stranded nicks in DNA. Add 32P, dATP, and other dNTPs to DNA polymerase I, which has 5' to 3' polymerase activity and 5' to 3' exonuclease activity. To prehybridize, add non-specific ssDNA. 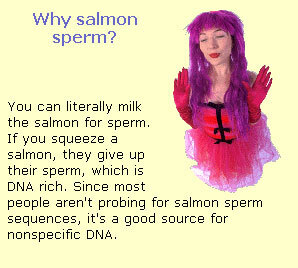 Somicated salmon sperm DNA is commonly used. Add 20X SSC, Denhardt's solution (ficol and PVP, which are large molecules to take up space and generate more contact; and BSA, bovine serum albumen, a non-specific protein), SDS (sodium dodecyl sulfate), and formamide. Altering the concentrations of formamide, SSC, and SDS affects "stringency," or specificity. If you have a higher stringency you should also have a higher degree of similarity between the probe and the target sequence.